Fire Engines Photos - Sulzer Pump from Dennis Merryweather TL? Sulzer Pump from Dennis Merryweather TL? This is a pump I have acquired for restoration and this photo was taken when I first got it home three years ago, it is now stripped for a full restoration. Through internet research and the help of one of this forums members I understand it may have come from a Dennis Merryweather TL, the makers plate states 1939 and has the same order number (1384) of an identical pump on a now beautifully restored Dennis Merryweather TL found at picture #22758 on this site. It may also of course have come from a trailer as I now know sulzer did produce them (although I can find no pictures in any books or the internet of these to see if they look the same). Some of the ancillary fittings that came with it have OCFB (Oxford City Fire Brigade) stamped into them and it was picked up by its previous owner from a factory in Watlington around 25 years ago now. Does anyone know if any Merryweather TL's went to oxford at the start of the war? I have also found pictures of Leyland and AEC Merryweathers from early on in the war but they either don't seem to have a pump (behind the seats) or have a sulzer with a larger square casing, presumably with a higher capacity. 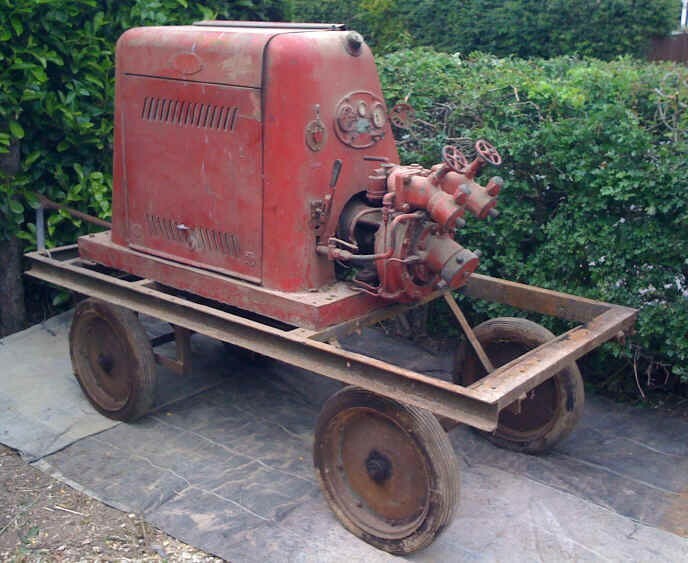 This may have well been fitted to a Medium Wartime Trailer Pump, powered by a 12HP Standard engine for towing behind a requesitioned vehicle or later ATV. Added by Brett Clayton on 25 January 2013. Added by Chris Wilson on 27 May 2014. A number of the wartime TLs were retro fitted with pumps utilising Sulzer trailer pumps with the casing on one side cut away. More details in Wheels of Fire by Alan House. Added by on 29 May 2014. This would be GLW 435 which passed from the N.F.S to the City of Oxford Fire Brigade in 1948. Added by Dusty on 29 May 2014. Added by Chris Wilson on 05 June 2014. One of a group of London Fire Brigade Engines, GGK943 GGK944 GGK 946 and GGK947 all being 1940 Dennis Merryweather. If its GGK946 it left the UK in the 1970s and is now being restored in the USA. Added by Boxfon.ru on 24 October 2015.